Here is a quick look at the popular styles of mason bee houses. The best are designed to fit the specific needs of the bee in both hole size and tube depth. The right depth will assure the correct ratio of male and female bees. Too short and you will have mostly male bees. Although I have seen orchards successfully using tubes less than 5 inches, it is best to use tubes 5 inches or longer. Holes drilled into 2 X4's are usually considered to be too short. Summer native bees include leafcutter bees. These are excellent pollinators. You will sometimes get leafcutter bees in your mason bee house if you leave the house out during the summer. However, if you want to raise the leafcutter bees, then you will do better to set out a house designed especially for them. They are a smaller bee and prefer a smaller diameter hole. 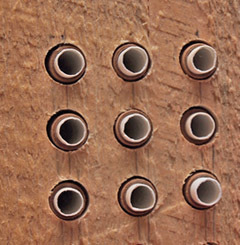 Mason bee houses are designed to duplicate their natural nesting tubes. The best will offer superior protection of the bee larva and also allows you to easily harvest the cocoons. Harvesting the cocoons is extremely important and is essential for healthy bees the following spring. As long as you Provide an available source of pollen each spring, supply clean holes for nesting, and harvest the cocoons each fall, you help guarantee an increase in bee population. There are a number of styles of mason bee houses to meet this need. Almost all systems will work, but some are definitely better than others. Each system has its ardent followers and feel that their preferred housing style is the best choice. We will examine a few here. Mason bee houses made from wood are considered to be the best material. Wood is the natural material used by orchard bees. Wood absorbs moisture, which helps prevent mold problems. Some houses, or "condos" as some call them, are made of plastic. Many owners seem quite happy with them. Remember that mold is detrimental to the bee larva. If you live in a wet, humid climate, I would experiment before investing a lot in plastic to see if you experience mold problems. Early Spring Bees - Emergence when air temps are 55 degrees for several days. Osmia Lignaria (Mason Bee), Has a very broad range throughout the U.S. and Canada. Osmia Cornifrons (Hornedfaced Bee), Introduced from Japan in 1930's. Has a very broad range thoughout the U.S. and Canada. Osima Ribifloris ("Blueberry Bee") - Will pollinate more than blueberries. I am personally experimenting with this bee species and will keep you posted. Late Spring Bees - Emergence when air temps are low to mid 60's. Osmia Californica (California Mason Bee), Range is limited to a small area in California. Summer Bees - Emergence when air temps are around 70 degrees. Megachile rotundata (Alfalfa Leafcutter Bee), Introduced from Europe, the leafcutter Bee will pollinate a very broad range of plants. Alfalfa leafcutter bees are another Huge Success Story! Introduced from Asia, alfalfa growers are now using these bees as the primary pollinator for alfalfa. Why are they so good? They do so well at alfalfa pollination because the leafcutter bee forces open the flower in order to pollinate, something honeybees will not do. Alfalfa growers are settting up leafcutter bee houses in the alfalfa fields to ensure successful pollination each year. Best of all, alfalfa leafcutters are not plant specific pollinators. They are extremely easy to raise and will pollinate most any blossom or flower you have. 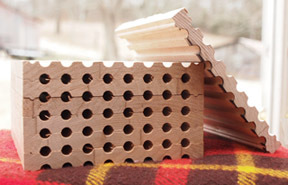 Solid wood blocks with drilled holes are probably the most common and most popular. Holes should be drilled at least 5 inches deep. However, holes that are 6 inches or deeper are best for the proper ratio of male to females bees. The above photo shows a large "researcher block" made from 6 1/4" X 6 1/4" rough sawn, raw wood timbers. I make these blocks myself and will use them in my research this year. This nesting block is shown before placing inserts into the holes. The wood is completely untreated and must be stored outside to keep the wood from checking. I can harvest up to 420 cocoons with each block. always include disposable nesting tubes in the holes. Never use raw wood alone without disposable tubes. 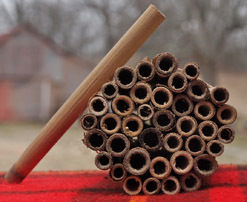 The photo to the right shows a mason bee house with cardboard tubes with paper inserts. The tubes can be removed and opened to harvest the cocoons. Never use raw wood alone due to pollen mite's rapid accumulation inside the tubes. The mites are not easily removed and can hide in crevices in the wood. If you reuse raw wood nesting blocks, the pollen mites that have multiplied tremendously inside the tubes will kill future generations of bees that reuse the block. It is impossible to harvest cocoons from raw wood blocks. Tube choices include cardboard tube inserts, cardboard tube with paper inserts, or rolled parchment paper inserts. Do not use nesting blocks without inserting some type of removable nesting tube. The wood holes are drilled to match the outside diameter of the cardboard insert. The inserts can be taken out in late fall when they are opened and the cocoons removed and cleaned. New inserts can be inserted for use the following year. Inserts are inexpensive, so this options is by far the best. 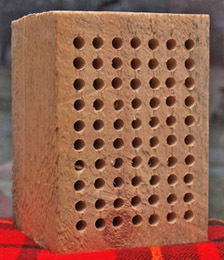 Blocks made from solid wood also help prevent paracitic wasps (Chalcid Wasp) from attacking the bee larva. Chalcid wasps are a serious enemy of mason bee larva. Blocks can be purchased or you can make one yourself. You really need a drill press, however. The price for a block is reasonable if you would rather not hassle with making one. Most people just starting out will often use raw wood blocks without inserts. They are easy to make from 2 X 6's. These are essentially a death trap for bees. Pollen mites will accumulate inside the tubes and are difficult to impossible to remove. After a few years your bee mortality will be nearly 100%. The absolute worst are the blocks with drilled holes that do not penetrate completely through the blocks. Using raw wood blocks make it impossible to harvest the cocoons. Stacked wood trays are a favorite of other experienced mason bee keepers. Each tray has several channels that are dadoed or routered to the correct width and depth. The bottom of the channels can be square or rounded. The tube is formed when the next tray is stacked on top forming the channel. The trays are held together by straps or are bolted together to keep them tight. There are many benefits to using this type of "bee condo". Most important is that access to the cocoons are as easy as unstacking the trays. The cocoons can be removed easily and the debris, mites, etc. can be scraped out and thrown away. You can also make the channels as long as you want. While six inches long is preferred, you can make the channels 10 inches long if you like. The bees will often use the whole length or stop at the length the bee feels is appropriate. The drawbacks to this system is that sometimes the wood trays warp. If that happens or if there are any gaps, no matter how small, the pollen mites can easily crawl from one channel to another and damage other cells. Keeping them tight is important. A second drawback is that wood trays usually do not have inserts. The raw wood must be thoroughly cleansed after each season. Square bottom channels work, but require the bee to collect more mud to seal each cell than rounded bottom channels. 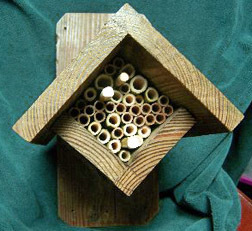 This is a probably the most basic design for mason bee houses, yet very effective. Bamboo or natural reed tubes placed tightly in a wood box or can. They are not quite as fancy as the wood blocks or trays, but you can get a lot of tubes in a small area. The tubes must fit tightly. If they are loose and move around the bees will not use them. This method is good to use if you need a high volume of bees, such as in an orchard, etc. When choosing the best tube material, there are a few things to consider: Be sure the tubes are easy to open or split (reeds). Bamboo can be difficult to split open to harvest the cocoons. They must be able to handle a season of moisture or humidity. Paper tubes may not suffice. They also need to be the right size. 5/16" to 3/8" inside diameter for mason bees and 1/4" for leafcutter bees. If they are too large, the bees may avoid them. The photo shows natural reeds in various sizes. The bees will select the tubes they find to be the right size for them. The bamboo can be squeezed into an empty coffee can or any number of creations. The photo at the top of this page is an example of a bamboo or reed tube holder. There will be gaps between the tubes, so the walls of the tubes need to be thick enough to prevent parasitic wasps from attacking the bee larva. These small wasps, called Chalcid Wasps, can hear the larva inside the tubes. They locate the larva and use their ovipositor to pierce soft wood and deposit an egg into the cocoon of the mason bee. The wasp hatches, consumes the mason bee larva and a wasp emerges from the cocoon instead of a bee. Mason bee houses should be placed in a sheltered area facing east or south. The house needs to be protected from rain and strong wind, but not in complete shade. The best is morning sun hitting the house. The warmth from the sun gets the bees going. The bees will spend the night in the tubes. They will also remain in the tubes on windy days. Bee Fact #1: Harvesting the bee cocoons each fall is very easy and it ensures you have a growing population of healthy bees each year. Bee Fact #2: Mason bees almost never sting. Only the female bee is capable of stinging, but you have to work really hard to get stung. There is no venom so the sting is said to feel like a mosquito bite. Bee Fact #3: If you don't have any mason bees in your immediate area, you can purchase bee cocoons and set them out a few days before need them. If you start with 15 female bees, and each bee fills 3 tubes, you can harvest up to 270 cocoons in the fall. Bee Fact #4: Honeybees will fly several miles to find pollen, while the mason bee rarely flies more than a few hundred feet. If you have what they need, they may never leave. Bee Fact #5:Male mason bees mate and die. Female mason bees will live until all the tubes are filled or the pollen source is gone, about 3 to 5 weeks.